As a kid I had an Atari 2600 but never had a computer until after high school. This was partly due to the technical progress at the time and that my family wasn't really computer oriented in those days. I didn't have a Comodore or an Atari computer - I was a gamer. When I became more familliar with the 800 and XL series, the gamer in me wanted to put carts into those slots and see the results. Hearing that this series was quite similar (game-wise) the the Atari 5200, I had to have one... or more! Atari was involved in what would soon develop into a full-blown price war when Jack Tramiel of Commodore International was attempting to undercut his old enemy Texas Instruments. TI had undercut Commodore's calculator business only a few years earlier, almost driving him from the market, but this time Tramiel's supply was stronger than TI's, and he could turn the tables. Although Atari had never been a deliberate target of Tramiel's wrath, they, along with the rest of the market, were dragged into "his" price war in order to maintain market share. The timing was particularly bad for Atari; the 1200XL was a flop, and the earlier machines were too expensive to produce to be able to compete at the rapidly falling price points. The solution was to replace the 1200XL with a machine that users would again trust, while at the same time lowering the production costs to the point where they could compete with Commodore. Starting with the 1200XL design as the basis for a new line, Atari engineers were able to add a number of new IC's to take over the functions of many of those remaining in the 1200XL. While the 1200XL fit onto a single board, the new designs were even smaller, simpler, and as a result much less expensive. But by this point, in early 1983, the price war rapidly drove prices downward. Atari, attempting to beat this downward pressure, took the opportunity to move production of the new machines to the far east, where they could be produced at even lower cost. Several versions of the new design, the 600XL, 800XL, 1400XL and 1450XLD were announced at the 1983 Summer CES. The machines had Atari BASIC built into the ROM of the computer and the PBI at the back that allowed external expansion. The machines looked similar to the 1200XL, but were smaller back to front, the 600 being somewhat smaller than the 800 front-to-back (similar to the original Sweet 8 project). The 1400 and 1450 both added a built-in 300 baud modem and a voice synthesizer, and the 1450XLD also included a built-in double-sided floppy disk drive in an enlarged case. However, the production move ran into unexpected delays. Originally intended to replace the 1200XL in mid-83, the machines did not arrive until late in 1983. Although the 600/800 were well positioned in terms of price and features, during the critical Christmas season they were available only in small numbers while the Commodore 64 was widely available. Although the 800XL would be the most popular computer sold by Atari, it was unable to defend Atari's marketshare, and the race to the bottom gutted their profits. Combined with the simultaneous effects of the video game crash of 1983, Atari was soon losing millions of dollars a day. Their owners, Warner Communications, became desperate to sell off the division. Through this process the 1400XL and the 1450XLD had their delivery dates pushed back, first by the priority given to the 600XL/800XL, and later by the 3600 System. In the end the 1400XL was eventually canceled outright, and the 1450XLD so delayed that it would never ship. Other prototypes which never made it to market include the 1600XL, 1650XLD, and 1850XLD. The 1600XL was to have been a dual processor model capable of running 6502 and 80186 code, while the 1650XLD was a similar machine in the 1450XLD case. These were canceled when James J. Morgan became CEO and wanted Atari to return to its video game roots. 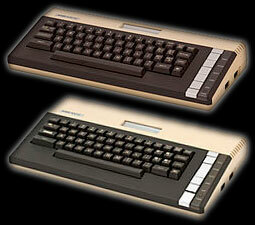 The 1850XLD was to have been based on the custom chipset in the Amiga Lorraine (later to become the Commodore Amiga). Although Commodore emerged intact from the computer price wars, fighting inside Commodore soon led to Jack Tramiel's ousting in January 1984. Looking to re-enter the market, he soon purchased the Atari consumer division in July 1984 from Warner for an extremely low price. When Jack Tramiel took over Atari the high-end XL models were canceled and the low-end XLs were redesigned into the XE series. Nearly all Atari's research, design and protoype projects were arbitrarily cancelled often with the new management completely ignorant of the nature of the projects. This included the Amiga-based 1850XLD system and other existing 68000 prototypes while Jack Tramiel was primarily focused on developing the 68000-based Atari ST system and bringing in ex-Commodore engineers to work on the ST line.